Some additional spoilers copied from Oro Jackson Forums. - Luffy grabs Brûlée uses her powers to escape through a mirror. However both appear on Peanut Island where Big Mom is. He dodges a sword attack from Amande and a giant peanut thrown by a rampaging Big Mam and must flee again. Edited by Furinji Saiga, 22 November 2017 - 12:49 PM. Translation still being fixed a bit." Luffy: I came here to win! Chopper sees that and is speechless. Edited by Qbix, 06 December 2017 - 08:49 AM. 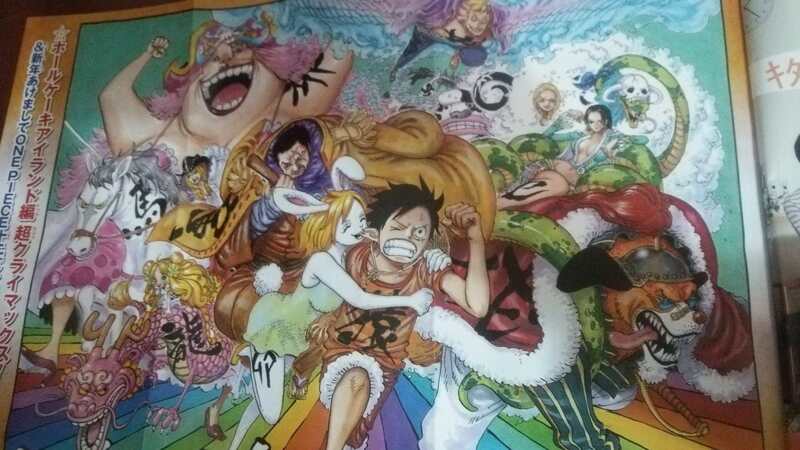 All chapter focuses on Sunny, it is the fight against Big Mom. BM starts tearing apart the ship, searching for the cake. Jinbe tries talking with her, but is attacked by a Napoleon coated with flames. 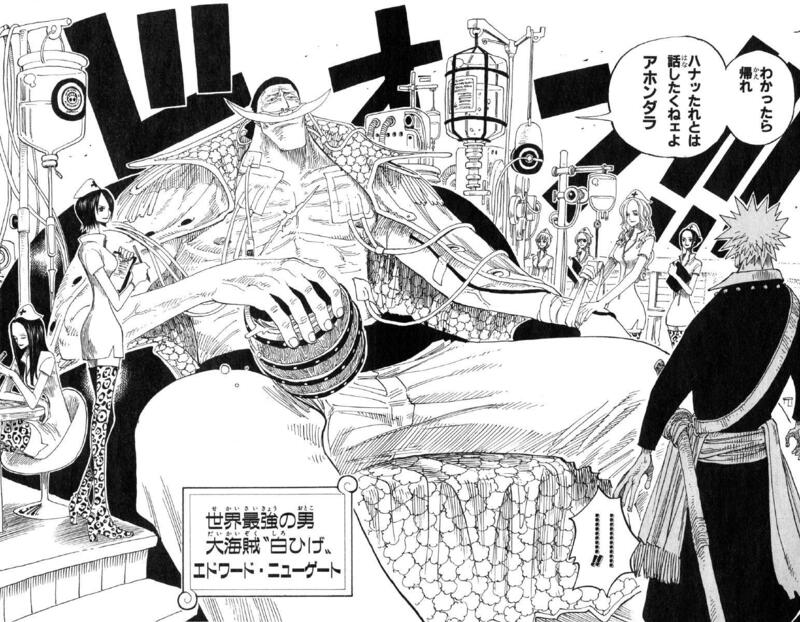 Jinbe blocks it with armament haki in his arms, but is sent flying into the sea. BM keeps cutting the ship, and then attacks with her hand (trying to squash) Nami. Chopper blocks the attack in his defensive form. 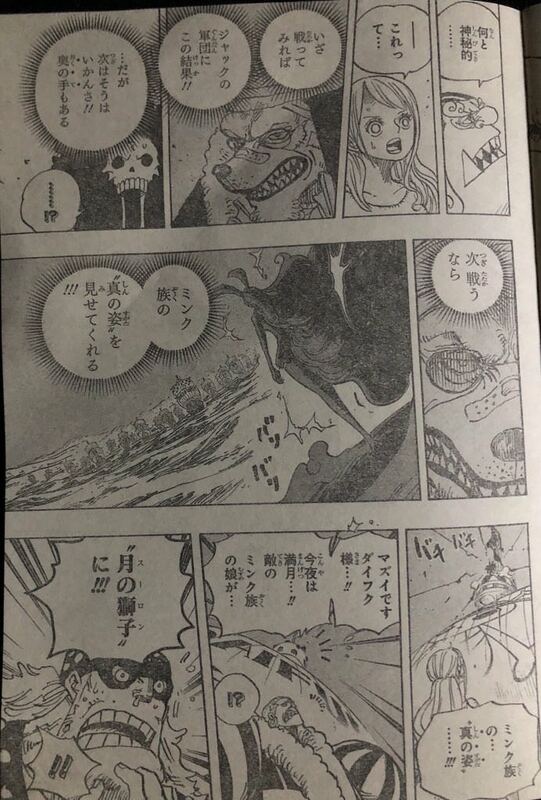 Jinbe attacks from the sea, wetting BM and separating her from Prometheus. He then jumps to the ship and sends BM flying with a punch. Zeus rescues BM and gets angry. He thunders Brook while BM is saying she will cut Sunny in half. Brook is faster and he is the one to cut Zeus in half, Nami uses this chance to activate Zeus and he thunders BM. Zeus now is tiny and is in Nami’s hands. BM is still conscious and enraged, flying in a crazied Prometheus. Edited by Furinji Saiga, 28 December 2017 - 06:18 AM. And someone is watching their battle. It's the 33rd daughter Charlotte Furenpe, 15 years old. She’s also the chairman of Katakuri’s fan club. She says that she will be the king of all sisters. She instructs her subordinates to attack Luffy but their attacks don’t connect. Katakuri foresees every move Luffy tries to make and plans accordingly. Katakuri: Stop standing up. We already know all about your plans! ​*There are slightly more details but will translate them later. Chapter 892: Acknowledging a Strong Enemy. Peros doesn't know if he should destroy the cake or leave it alone since if he destroys it Big Mom will kill him, but he thinks Bege poisoned it. If Big Mom dies, then the kingdom is doomed, and if she doesn't get cake she'll doom the kingdom, so it's sort of "damned if you do, damned if you don't." 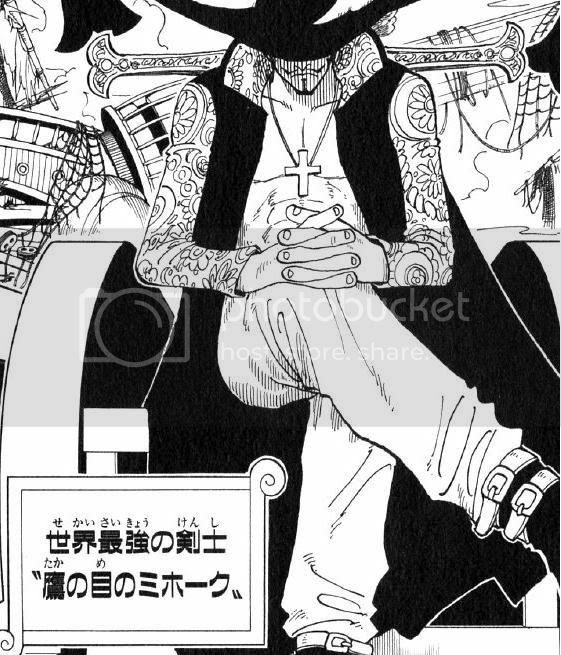 Meanwhile Bege promises Sanji they won't do anything to the cake, but afterward they're free to do whatever they want to Big Mom, and Sanji agrees to that since his mission was only to make and deliver the cake. Brook lied to Sanji about Pedro dying for some reason...Nami was about to tell him, because he asked about Carrot and Pedro, but Brook said they're both resting in the next room. Peros and the others go after Bege. He tells Smoothie (14), Citron (15), Cinnamon (16) to go after them while he and the other ship go after Bege. Jinbe says Big Mom's forces have them completely surrounded so they've acknowledged how strong the Straw Hats are. They've still got three hours till getting to Cacao Island but they have no idea when Luffy will show up. Sanji says there's only one plan they can go with then. Meanwhile Oven is telling everyone on the island to break their mirrors. So there's only one way for Luffy to escape if he tries to, where they'll get him. Now to the fight. 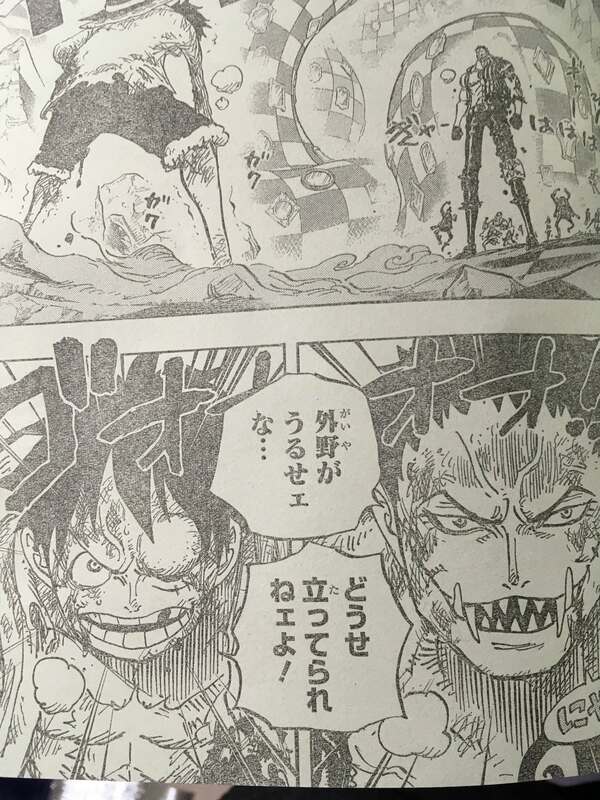 Luffy won't stay down and Katakuri realizes if the fight drags on his observation haki will become as good as his. So he's trying to finish this quickly. Edited by Furinji Saiga, 25 January 2018 - 01:54 PM. Here's a proper summary from actually reading the chapter. Chapter 893: "Charlotte Family 36th Daughter Flanpe". Flashback to Rayleigh teaching Luffy to use the Observation Haki saying that it's essentially one's instincts amped up to a higher level. The ability to unconsciously sense things and react to them. Flampe shoots a paralyzing needle at Luffy but he avoids it. He's fading in and out of consciousness --and every time he's unconscious his instincts or observation haki kicks in and saves him. The underlings are trying not to be discovered by Katakuri, but Flampe is laughing at Luffy who's in her words "Wobbling around like a newborn deer". Katakuri finds out they're watching because she's dissing Luffy. He gets mad at Flampe. He realised Luffy's movements were weird, but he didn't know why, and upon finding out Flampe is there, he puts two and two together. He says "As if I'd want a victory where I got help from you all sniping from the sides." Flampe says she's the cutest and most sensible of Katakuri's little sisters, so she's the only one who truly gets him. 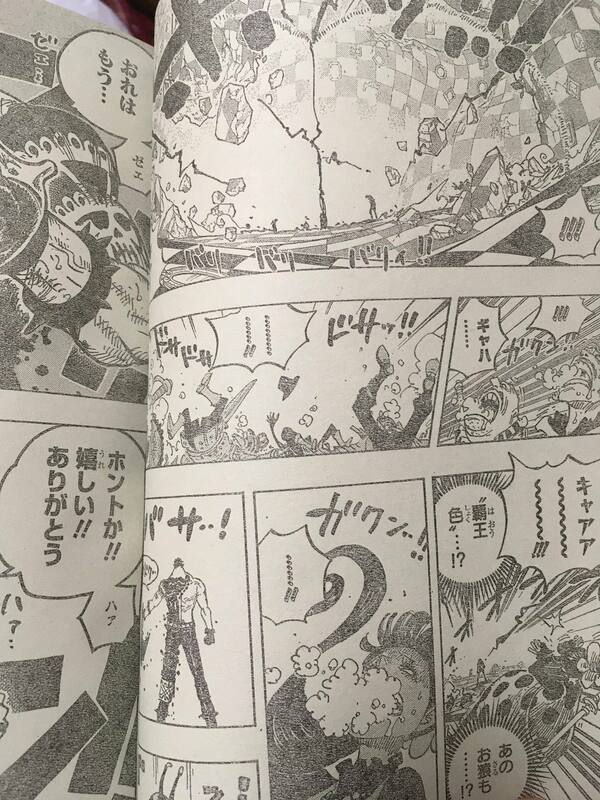 But Katakuri stabs himself responds "A MAN'S FIGHT DOESN'T NEED BACKUP! TO LAUGH AT HIM IS THE SAME AS LAUGHING AT ME!" She sees his mouth and face. They think Katakuri's face is the result of some curse. Flampe doesn't even believe he's her brother anymore and compares him to an eel which is what they used to call Katakuri as a kid. Flampe tells her underlings to take his picture so they can show it to everyone. She's mad he'd do something as disgusting as getting his blood on her. 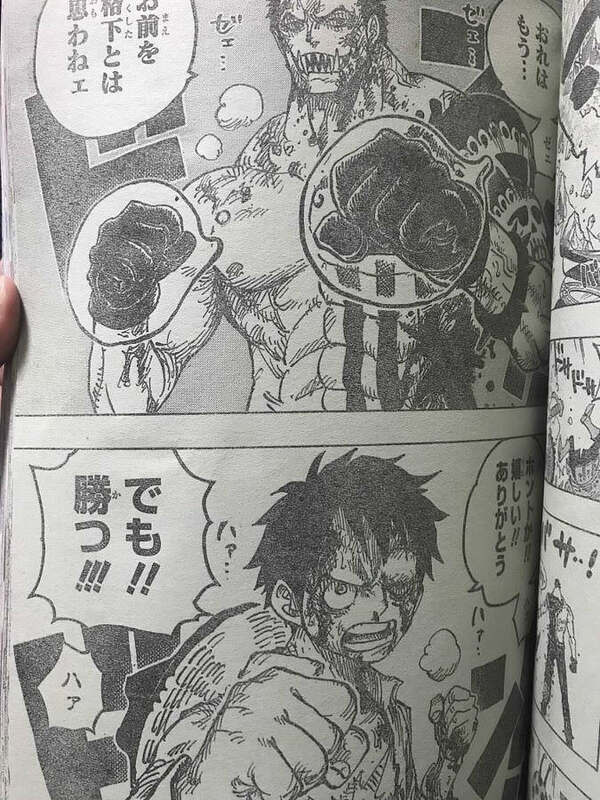 Katakuri apologizes about the interference, and says a pirate's fight has no place for cowardly stuff like that. Katakuri has the Conquerors Haki and knocks everyone out. Katakuri: "I won't....think of you as beneath me anymore". Luffy: For real? Thanks...!! but I'm going to win! Edited by Furinji Saiga, 01 February 2018 - 12:27 PM. Edited by Furinji Saiga, 01 February 2018 - 12:35 PM. 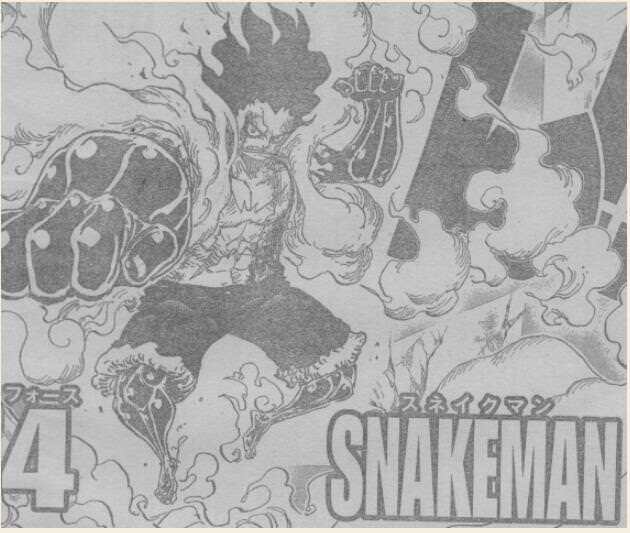 Snakeman is pretty skinny g4 Luffy, with haki on his arms/legs (not entire body). Luffy's attacks are "surprising" (?) He uses a move called "black mamba" (high speed gatling) and "jet culverin" (python). Kat uses new techniques too, as "zangiri mochi". He has spikes on his arms. Luffy uses "king cobra" at the end (Kat isn't down yet). Edited by Furinji Saiga, 15 February 2018 - 05:48 AM. Edited by Furinji Saiga, 15 February 2018 - 12:35 PM. Edited by Enbima, 15 February 2018 - 02:30 PM.